We love this place! Everything was great. Best beach view location in Maui with sunset views year rounds. Only 30 steps to the beach. Fall asleep to the southing sounds of the ocean while cool trade winds caress your skin. Partial View of Napili Bay Beach and the Hawaiian Island of Molokai. The place is excellent! Very clean and with modern new appliances. There was only 1 little bump in the entire stay, and that was beyond the owner/condo/manager's realm of influence. A watermain broke and the entire area was without water for about 12 hours, but luckily it was overnight, so only a bit of an inconvenience. I did try to call the resident manager twice, but it only went to voicemail and I never did get a call back. The location is absolutely excellent! walking distance to the beach at Kapalua, which is great for beginner snorkelers, and the local beach is excellent for playing in the surf with boogie boards. One bay over to the left is turtle bay, which is excellent for snorkelling and filled with turtles that are relaxing and sleeping with more than a few cleaning stations. we loved every minute of our stay and would gladly return. Very well kept. Nice and clean and very comfortable. We appreciated the gift bag. It was a nice touch. I was worried about no air conditioning but the ceiling fans kept us cool. It did get a little noisy sometimes but nothing too much. The unit was well kept and stocked with lots of kitchen items. There were also beach towels which was awesome. Saved us from bringing them. The bed was amazing! It was our first visit and we do definitely hope to return. Thank you for your generous hospitality. Napili Bay is our favorite beach on Maui, and this Condo is our new favorite place to stay. It has everything you’ll need, and it’s right on the beach. The condo was perfect for us, clean, updated, comfortable. Thank you for the welcome gift basket, Jim!! We had a wonderful stay at beautiful Napili Bay, we will definitely be back. We had 2 great weeks in #217. We loved our stay at the Napili Bay Resort. We had everything we needed in a well appointed and comfortable studio. Not a lot of room, but it only mattered on rainy days - otherwise the beach was steps away and it was heaven being able to grab our chairs and umbrella and camp out there for the day - the unit was close by to go back for drinks and snacks. The whales and dolphins came out to play not far off the beach, and snorkeling was great. #217 was clean and updated. No air so it could get warm, but the fans usually did a great job of cooling down the room. Appliances are new, the bathroom is newly renovated and clean, aside from some beetles that come out just at night in the bathroom - still not sure where they came from but they disappear in the morning. Parking is really easy, laundry and BBQ facilities are close by and overall the grounds are really well kept.We definitely recommend this unit. Anyone would be lucky to stay there! We just returned from an 8 night stay at beautiful Napili Bay and can't say enough about our experience. Our condo was everything we viewed on-line but better. Extremely well equipped kitchen, an amazingly comfortable bed, a beautiful new shower and the soft sound of waves crashing. We loved the location because we were right on Napili Beach and a short walk to Kapalua Beach (which has amazing snorkeling) and the beautiful Kapalua Coastal Trail. The condo has beach chairs, towels, boogie boards and a cooler so you can pack your snacks and head to the beach which is steps away from the condo. Some of our favorite places for sunsets and happy hours were the Sea House Restaurant on Napili Beach and Merriman's at Kapalua Beach. This was my 3rd time in Maui and I love the Northwest area of the island. You are a short drive to Kaanapali and Lahaina if you want more action or nightlife. We loved our stay and highly recommend this beautiful condo should you be looking for a spot that is a bit more remote but a short drive to the busier spots. Mahalo!! Great location right on Napili Bay. Condo was clean and just as advertised. Suit 217 was not on the beach but had a beach view which we decided was better than "on the beach" because of the noise on the beach. No A/C but it was not an issue because the wind never stoppen blowing throught the condo which we lilked. Condo had 2 chairs and 2 boogey boards (only request would be to have a beach umbrella with the chairs). Overall a 5/5. We will stay here again if we come back. Mahalo. That condo was perfect for me and my boyfriends staycation anniversary. It was comfortable and perfect size and location from napili bay! Definitely would stay here again! This condo is perfection. The bed was the comfiest out of all four places we stayed on Maui. And the cross breeze provided by the window and door shutters was AWESOME!Very clean and LOVED the welcome gift. Great touch. And beach access was seconds away from our front door. Loved! Thank you for your stay and review. The bathroom was last renovated in 2001 and is scheduled to be renovated again in August 2018 with a new walk-in shower and new porcelain tile. The pocket door to the bathroom is being repainted. Thank you for catching this. We had a wonderful 6 days in Jim's condo #217. It was comfortable, clean, and well equipped.Having our meals on the lanai was a highlight of our day. Being so close to the ocean on Napili Bay is the BEST!!!! We love Napili Bay Resort -- this was our fifth stay at NBR and first time in unit 217. You can’t beat the location of NBR, within walking distance of two of our fav restaurants (Gazebo and Sea House) and great snorkeling. This unit had plenty of storage and bed was comfy. I especially appreciated the comfy couch to relax on after being on the go each day. The goody bag of snacks and water was also appreciated. Unit 217's location is perfect -- you can see and hear the waves but not the noise from beach goers. We heard a bit of construction noise from the Napili Surf Resort renovations next door, but it did not bother us. I believe the reno is scheduled for completion next month (Dec 2017). We would definitely stay in this unit again. Jim's Condo was absolutely perfect and we would not hesitate to recommend it. Tastefully decorated, fully equipped and the king bed was very comfortable! A canopy of trees, a view of the ocean and the sound of surf! What more could you ask for. Our Toaster broke on our second day and within hours there was a new one hanging from our door from Jim's colleague Lisa. Napili Bay is stunning and a perfect location to explore the beautiful island of Maui! Excellent, clean, well furnished unit located on gorgeous bay! A wonderful home away from home. We had a wonderful time. Everything was great. We really enjoyed our stay at 217. Personally we like staying on the second floor back away from the beach where you have some privacy. There still is a nice view of the ocean from the patio. The condo is very well layed out and the appliances were relatively new. Jim the owner is very helpful and responsed quickly to any questions we had. We won the Maui Jackpot! The condo was fantastic! There's nothing like sleeping on a high-quality memory foam mattress while hearing the waves crashing on the beach. With the full kitchen and grill outside we cooked some amazing meals. We were probably 200 feet from the beach and only a few minutes by car from restaurants and a grocery store. Lahaina is only 15-20 minutes from the condo. It made a good vacation great! We loved our stay in napili bay! Perfect location. Condo had all necessities. Loved sitting out on the deck. Can't wait to come back Mahalo! What a great unit to stay at the best beach!! The bed was fantastic. Highly recommend for any couple!! We had a great time in Napili Bay for nine beautiful days in Maui. The condo was clean, conveniently located to the beach and had all the facillities we needed. We spent many long sunny days at the D.T. Flemings Beach Park, which as well as only being ten minutes away, has great walks and secluded beach spaces. Napili Bay is great for sunsets, which is one minute from the condo. Local facillities like the supermarket are only five minuteas away. Nice to relax on the beach, then up to the condo for a gin and tonic as the sun goes down (you can get a nice view of the beach).We enjoyed our visit. Napili Bay is a throwback to the 60's and 70's when resorts were intimate and only 2 or 3 stories high. We have not been back for over 10 years and were dismayed at the development along Honokowai and Kahana. But Napili Bay is pretty much the same and these particular units are a treasure. Unit 217 is far enough from the beach so the surf is not roaring in your ears but you can still hear it as it lulls you to sleep at night. Although we had some warm days with the loss of the tradewinds, having 2 ceiling fans kept the room comfortable. We liked the jungle vegetation we could see from our lanai instead of looking right into another resort. And if we turned our heads you could easily see the beach. You are well supplied with beach chairs, beach towels, the bed is comfortable, the kitchen is well equipped. I think they have just about thought of everything to make your stay pleasant. The grounds are very nice too with a barbecue area and a laundry. Mahalo to Jim and Lisa for a very nice place. Jim's condo was perfect for our needs. The atmosphere of the place was very mellow - not like a crazy busy resort. We loved our leisurely breakfasts on the lanai with just enough of an ocean view that we could watch whales further out. Napili Beach was beautiful and intimate. We used the community grill one evening and met some other nice guests, as well. If we ever get back to Maui, we would definitely stay here again. A tapestry of green jungle outside your 2nd floor lanai lends a treehouse vibe and fosters privacy. The sounds of the surf are audible, but not as strong as a beachfront location; this can be very welcome if you are unaccustomed to the sounds of surf and trying to navigate jetlag. The combination of the visual and aural in 217 is utterly soothing. Local art, furnishings with a zen flair, and an enchanting sculpture enhance the sense of place. Fabulous proximity to beautiful sandy Napili bay, this unit is a peaceful pad in paradise. Condo 217 at the Napili Bay Resort greatly exceeded our already-high expectations. This condo is the perfect setup for a couple on vacation: full kitchen with large stove-top and oven, large fridge, and even pots & pans & spices etc for cooking; a large, very-comfy, king-sized bed, and huge couch and living room area; cozy lanai with a view of the ocean around the corner; a few easy steps away from a gorgeous beach with a view of Moloka'i and fairly frequent humpback whale sightings. The beach chairs, towels, and small cooler were perfect for spending time on the beach. There are a few amazing restaurants a short walk away along the beach, as well as a shopping center with more dining choices and a good sized market less than 5 minutes away by car. We're already talking about returning! When we arrived, a nice welcome bag of goodies was awaiting our arrival. The soaps provided in the bathroom were really nice quality. I always appreciate that. This condo has upgraded tile in the bathroom and tile floors. There are also new appliances, all of which are in excellent condition and well-maintained. The bed is of excellent quality and the couch is especially comfortable. It has a lounge portion near the windows - wonderful! When the cable for internet was cut, the other condos were without internet, but our service was based on DSL (did I get that backwards). We were the only condo with service, which for me was very fortunate. I had to work the first few days I was there and did not need to leave the condo - in fact, I sat in great comfort on the lounge couch. The intenet speed was very good. The view to the ocean is pleasant when sitting outdoors and the overall air circulation in the condo seemed better than others we have stayed in. I noticed a few small things that could improve the overall impression. The mirrored closet doors in the bathroom need to be replaced and the sliding panel door that blocks the bathroom sink from the rest of the condo is splintered at the bottom. Oiling the cabinets would bring back the shine and remove water damage; the cabinets looked relatively new. I noticed a tile on the kitchen counter was coming loose at the end of our stay, even though we had not used that area excessively. This must be a hazard of the ocean climate. Perhaps granite would be better in the kitchen since the counter area is relatively small and the cost should not be too high. This was our first time to Maui and we stayed in four places around the Island, so we could see it all! We ended our trip at Napili Bay and absolutely loved this location! It is a smaller bay with amazing sand and gorgeous for swimming and snorkeling, to see turtles and whales, and stunning sunsets. Also, the Pavillion for breakfast on one side, the Sea House for happy hour or dinner at the other side are both great options you can just walk to! We also walked over to Kapalua bay for our best snorkeling experience on Maui. We were in unit #217, so just the tiniest view and we didn't use the patio but still we were happy to be so close to the beach. We were so happy it was very quiet, no traffic, which had been a problem at our other places.The units are small, but the bed and couch were so comfortable and everything was spotless and updated in the kitchen and bathroom. We just spent all our time outside. I would definitely stay again, great value for your money and nice people - so nice to get snacks when you arrive! Book this place before I do again. Jim is an incredible host with a remarkable place. BOOK IT. It's in an amazing part of Napili, right on the beach and walking distant to other fantastic beaches and hiking trails. The condo was very comfortable and with the lanai peaking out to the water, we woke up to the sounds of the beach every morning and fell asleep to the sounds of rain against the trees at night. This part of the island is pretty special. We will definitely be back and will absolutely look to book this condo again. I enjoyed my stay in unit 217. The arrival gift package was a pleasant surprise. The unit had all the kitchen amenities I needed. The beach towels were great too. Comfortable bed and tv / wifi all worked well! Thanks again for an enjoyable stay. Well, all I can say is this was the perfect experience. Everything that is described in the condo is exactly what you will find. Quiet location, steps to the beach. Beach chairs and boogie boards are included. Bed was very comfortable. Stop at the grocery store - either Costco or the Napili Market, which has everything and stock up for your stay. I highly recommend #217. We loved our stay at Napili Bay. When we arrived there was a gift basket for us with an assortment of local treats--this was a very thoughtful extra touch. The condo had everything we needed including beach chairs, beach towels, and boogie boards. The location was perfect, and we were very happy to end our honeymoon in a great place. We loved the condo - it was perfect. Nice gift basket and clean well appointed studio with full kitchen. Yes great price and we would love to stay there again!!! The room was perfect for relaxing on the beach. Very clean. Very peaceful. It is positioned in the perfect spot for hitting Napili Bay for snorkeling and swimming. Great vacation!! Condo 217 is conveniently close to the lovely beach of Napili Bay. The lanai has a generous partial view and ocean sounds are clear 24/7. The condo is clean and well stocked with thoughtful extras such as boogey boards and beach chairs. There is a very large comfortable king bed and perfectly placed levered windows to permit excellent cross ventilation. Snorkeling was very good and the barbecue area boasts 2 large modern Kenmore grills we took full advantage of. The resort is just 10 minutes from Kaanapali and 20 minutes from Lahaina. Aloha – Here…We simply enjoyed all with it amenities! Especially…the awesome sounds of waves crashing here onto the beach…24 HRS. One of the nicest units in Napili Bay Resort! We have stayed at Napili Bay Resort on a number of occasions and I have to say that unit #217 is one of the nicest. The bed is heavenly - very rare to find in any rental property. They have a cushy little sectional sofa that was wonderful for watching a little March Madness on the TV during our stay. The unit is very clean and very well stocked and the gift bag was a generous touch. We would definitely rent this particular unit again and I'm sure we will return to Napili Bay Resort as you can't beat the very short walk from blender to beach. Our second stay in 217 was just as lovely as our first. The unit was clean and very comfortable. The property was immaculate, and the beach is a stones throw away. We are starting to plan our next trip here already. Everything was perfect. We had everything we needed and we slept great! Being so close to the beach was wonderful. We were even able to see whales from the limited view from the lanai. The Napili Market was also a pleasant surprise. It was no more expensive than Safeway for the things we bought, and was so convenient. Enjoyed our stay very much. Condo location was amazing, just steps from the best little beach on Maui. Everything was very well thought out for vacationers, not just in the condo but the common areas as well. Secure beach access; fresh water outdoor shower next to beach; great BBQ area; icd machine, etc. Gift basket was a very nice touch. All the appliances and cookware were good/great quality. The bed was very comfortable as was the sofa. Bathroom area was a little worn but everything worked perfectly. The only nit-pick item would be soap/shampoo. It would be nice if more of both were provided. Hope to come back soon! My husband and I stayed 4 nights in unit 217 last week. Although it was a little small, we loved it! The bed was super comfortable, and the unit was clean with everything we needed. The best part was the fantastic location just steps from the beach! The beach is paradise! I love how the water glistens. And we both enjoy walking over to Sea House Restaurant for Happy Hour, appetizers, or dinner. We are now in a two bedroom condo about 2 miles away, but are missing our very convenient studio! Great location next to Napili beach—maybe about 50 yards from the water. The deck has a partial view of the water. Quiet, family friendly area. Easy check in and out. Easy parking. This condo has everything you will need and more. Upon arrival we found a lovely gift basket left for us by the owner. Good quality of sleep and cleanliness is most important to us. The condo was very clean and the bed was the most comfortable bed we have slept in, out of all the places we have stayed. This location is where you want to be. Mahalo Jim for the use of your condo on our mini vacation. We look forward to staying again. We have stayed at Napili Bay 217 twice before. The condo is perfect for our needs. We look for a place that is QUIET, comfortable and well stocked. This one fits the bill. The bed is very comfortable, beach chairs and boogie boards are in great condition. The "welcome" basket Jim provided is a very kind way of welcoming guests. Thank you for that added touch. We WILL be back for future visits. Excellent in every way. Best value on Maui - steps to the beach, clean, everything you need for a perfect vacation. As the locals say it has real aloha - mahalo Jim! We have no negative comments at all......In fact, we are keeping this condos information for future use!! Felt very welcomed off the bat with a great gift basket from the owner. Great hospitality! It was clean, with everything one would need. A snorkel set would have been nice to have, though. This location is great because it's a 1-minute walk from the beach, but it's also in the shade of trees and not in direct sun so it doesn't get out-of-control hot there. Great experience! We loved our stay at Napili Bay and in condo 217. The location was amazing. We could walk 2 minutes to get to the beach and go snorkeling, walk back to the condo for lunch, walk to the Gazebo restaurant, and walk to happy hour at the Seahouse restaurant. The condo itself had most of the amenities needed, the bed was comfortable, beach chairs were provided, and the view from the lanai was great. We loved it and will return for our next stay in Maui. The reservation process was very easy and we received several e-mails prior to our trip informing us of key details like directions and the lock box code. Included with the room were very nice beach chairs and new boogie boards. All of the appliances worked well and the WiFi had very good speed. We would not hesitate using them again on another visit. Very clean professional service. Great location with nice beaches and stores nearby. Secluded yet near everything. We enjoyed our stay very much. convenient to the beach and many attractions we were interested in. I would highly recommend this property. This was our first time in Maui. We have traveled to Mexico to "all inclusives" quite a few times before and wanted to try the condo experience. We were not disappointed. The ease of traveling around the island was fantastic. It rained about 50% of our 9 days in Maui, but this was not an issue as we drove around by car and had a fantastic time. The condo was a great place to kick back and relax. Comfortable was the first thing that came to my mine. Everything was accommodated right down to shampoo, soap, little things like pam spray for the frying pan, salt and pepper. The gift basket was amazing and so enjoyed after a long day of travel. I read all the reviews and thought the ones on this condo were always so good and I did not have any surprises. Clean, clean, clean. Thanks for the enjoyment of your accommodation. A perfect stay in a well appointed clean and comfortable studio 217 at the Napili Bay Resort. Had a fabulous trip/ honeymoon. Great location walking to beach. As soon as we arrived at our condo we felt right at home! We received a welcoming basket that was much appreciated. The condo had everything we needed to make our stay comfortable, plus much much more! The area was perfect, Napili Bay is beautiful! I would definitely recommend this condo, we will hopefully be back in the near future! When you book online, you sometimes take a chance to what it is exactly you will be walking into when you arrive. I had read the reviews on Condo 217, and it seemed to be that many people had enjoyed their stay. I have to admit that my expectations were met and exceeded with my stay. I had a short vacation of 3 nights, and the beauty, peace, serenity and location made this a vacation to remember.The bed is so comfortable, the sound of the waves puts you to sleep, and couch to chill out on, the lanai to enjoy a coffee or drink on, and the welcome basket was a plus.I normally stay only in Lahaina, and I took a chance on staying outside of the town. If you are looking for a lovely getaway, a beach outside your door, a welcoming ocean, and a place to just relax - this is the place to book. Thank you aloha Condos for this one-of-a-kind experience, I will be back for sure!Mahalo! We stayed in the unit for one week and were very happy with the view and the location. The unit was a studio unit so it was small but it had everything we needed. The beach was just steps away and the snorkelling was great. My husband swam with the turtles right off our beach.It did not have air conditioning but with door and lanai shutters open we had a nice cross breeze. When we walked into the condo we happily felt our vacation begin. We loved the island themed decorations, the sound of the waves and the gorgeous view from our private patio, the huge & extremely comfy bed, and the clean kitchen. It was home. It was spotless when we arrived and was easy to keep clean while we were there. The location was close to great snorkeling and other things we wanted to do. We prepared 24 meals and the kitchen had everything we needed. The landscaping was fun to look at - there were even bananas growing and an aloe patch if you got sunburnt. The wifi allowed us to post photos on the internet for our family back on the mainland. There were beach chairs, beach towels and boogie boards for us to use and even a cooler! It was the best place to stay for us because the location on the beach was incredible and everything we needed for our adventures was provided in the condo, so it was a truly relaxing and fun experience. This was my 1st time staying in Napili. This condo was impeccably clean. The cross breezes through the condo were amazing. Who needs aC with the fresh air blowing through and 2 great ceiling fans. The bed was very comfortable. And large. I didn't even realize there was another person in the bed next to me. This area is very quiet. By 9pm, there was only the sound of the ocean, trees rustling in the wind, and the birds. If you're into just hanging in your condo, this is not the place, as it is small. We found it perfect--as we were on the go every day, all day. The Snorkel Bobs rental is just around the corner. We got our snorkel gear day one. The markets are close by and so is the farmers market. We found this condo to be perfect! We love this property it's well maintained, clean & intimate. This marks our fourth stay at "The Napili Bay Resort" and our first time staying in condo #217. I will definitely book this unit again. I like the location of this unit (it's in the back) nice and quiet away from the beach. The beach front condos (stayed twice units 102 & 107 both were gorgeous) have a beautiful view of the bay but can be very noisy during the day as the beach fills up.There are mature trees right off the patio of #217 so it's very private.. The birds are lovely... it was such a pleasure to sip my morning coffee while listening to the birds. The ceiling fans insured a cool & comfortable room. I appreciated the boogie boards, chairs and cooler for our daily adventures. Can't wait to come back! A good deal for a fun time. We have stayed at Napili Bay Resort several times but this was our first time in condo 217. For the price, we felt like it was an exceptional value. The condo is very comfy with a nice big couch and a wonderful giant bed with ceiling fans above. It's easy living with a few steps to our most favorite beach ever. Great for running up to the condo for lunch or snacks. The bay has fabulous, easy snorkeling. The only improvement I would make to the condo is to provide a bright floor lamp, to replace one of the little lamps, for nighttime reading. We enjoyed staying in this condo. Thanks Jim. Catching up on much needed sleep and relaxation! We were very impressed with the level of ease it took to plan and implement this vacation. If you enjoy waiting in lobbies, checking in and out then this is not the place for you. The condo was clean and inviting. How could it not be you are in paradise right? All amenities are available to you and we needed nothing. There is a flat screen television and DVD player. Rebox is in the Napili market so you can rent movies if you want too. You are within walking distance to the beach and best of all in close proximity to the Gazebo! Finally the personal touch from Jim was what made this experience even more memorable. Napili Bay 217 was more than just another condo unit, it was the perfect escape, in a beautifully appointed condo, located on a pristine beach! You don't want to miss the opportunity to stay here and experienced the aloha spirit at its best. We felt right at home from the moment we walked in and felt the cool breeze coming from the lanai while devouring the chocolates left in the gift basket. The unit was very clean, beautifully furnished and the bed very comfortable (my wife said it was the best sleep she has had in a very long time). Just steps from this condo is Napili bay where you will find how amazing it is to simply sit and soak in the sun and views. Having the condo so close enabled us to be at the beach and walk back and forth for lunch and snacks. Overall, a perfect stay in a perfect condo! We were celebrating our 20 year wedding anniversary and booked this trip at the last minute. Jim was so helpful and accommodating to make our dates work that it made all our other planning so easy. We will be back and highly recommend to everyone reading this review...don't pass this place up. Nice condo in a great location. We really enjoyed our stay at Napili Bay Resort in condo 217. It was exactly what we expected from the description and pictures posted. It is small but very comfortable for a couple and had everything we needed, including kitchen and onsite laundry. The furniture was nice and updated. The bed was very comfortable. The condo was very clean. The location was great. Very close to one of the best beaches and in a quiet area (compared to Lahaina-kaanapali area). I was pleasantly surprised of the view we had from the lanai. We had a red eye flight and the condo offered late check out (for additional cost) which worked out great. I would and hope to stay here again. Very relaxing and comfortable, meeting all our expectations. A very clean and comfortable condo, tastefully decorated. The condo is well equipped. It is quiet but friendly. The welcome basket of treats was much appreciated. We really enjoy the fact that the building is a low-rise, two-story building right on the beach in Napili Bay. We spent a week in Condo 217, and loved every minute of it. We felt immediately "at home." The unit was super clean, tastefully decorated in "island" style, lovely lanai with a perfect vista down to the beach and water. Also, a very well equipped kitchen, etc. And, for the off-season price, it can't be beat. The only negative, is that voices, sounds, can travel easily between lanais and open windows, so all neighbors need to be respectful of each other. We had one neighbor who talked on her phone on her lanai into the evening, and we could hear every word. But, she departed after 2 days. I'm particularly sensitive to quiet, and that's just the reality of units that are open, and close together. Most everyone, however, respected the evening quiet time. Napili Bay has two restaurants a few steps up or down the beach, and a small grocery mid-way. It's possible to enjoy a week, and never need a car. The daily "sunset" was a ritual not to be missed. And the water, weather and fish and turtles make Napili Bay just about perfect. Having stayed in two other units this one was the best so far. The owner has it very nicely furnished and it is very comfortable. It was clean, updated and had everything we could have asked for. Nothing needed to be repaired. The breeze was perfect, as was being tucked in the back of the complex. You can still see the ocean from your lanai and hear it at all times. We enjoyed it so much we have already booked it for next year! This ways my second stay at The Napili Bay Resort; the last time being 10 years ago and in a different unit. Unit 217 was perfect and has every amenity to provide all the conveniences, and then some. The unit was spotless and the furniture was very comfortable. We met several unit owners out at the Bbq's (which looked brand new). They're a great group of people and take a lot of pride in their property - it shows. The view from the Lanai is great and Maui never disappoints, nor does Napili Bay. Mahalo for making us feel so welcome and ensuring our every need. It was a perfect vacation. We will be back soon! We totally enjoyed our week in #217 and appreciated the quiet,laid back ambiance and being just steps from Napili Bay beach. Great attention to detail and the condo is so well equipped we could have easily stayed a month (oh how I wish!) Appreciated the very nice gift basket that greeted us and made us feel so welcome. Falling asleep and waking up to the birds singing in the trees just beyond the lanai was awesome. We'll be back! Had a wonderful 12 days in Condo 217. We never left West Maui. Woke up every morning to the sound of birds. Location was amazing, Napili Bay was perfect for a morning snorkel and afternoon sunset. The unit was equipped with everything you would need. Appreciated the binder with all the restaurant menus, we added some and put the dates at the top. Thanks for the beach chairs and boogie boards!! The condo is beautifully furnished and toally equipped with everything you need for a perfect stay. Close to the beach, many ammenities,quiet and well kept. Best way to end 2011 and begin 2012 ! Clean, comfortable, modern condo. Excellent, easy check-in and online booking. Absolutely the best web-site. Owners keep you informed of your rental and any charges due.Napili Bay Resort, the beach and area are wonderfully laid back and well cared for. Even during the holiday season it was never too noisy. Beach chairs and boogie boards, cooler etc. help get you relaxing right away. Clean studio with chaise lounge couch and king-sized memory foam bed. Comfortable bed + sound of waves = great sleep. Kitchen has many appliances and cookware. Thoughtfully included a cooler and boogie board for guest use. Unit is tucked away from beach, facing a small yard and trees with small partial ocean view. beach-front property. Close enough to hear waves but not the beach guest noise. Would definitely rent this unit again! A great quiet place to visit Maui without going broke! Our stay at unit 217 was not our first one. Jim does a great job putting together an environment that is very relaxing and has what a couple needs while staying there. This trip was in celebration of our 25th anniversary and we chose to come back here as we knew it would be a nice and quiet place to have as our home base while in Maui. Jim had a nice welcome basket waiting for us which was very much appreciated. There are only a couple of very minor things we would include here, just for Jim's awarenesss... Specifically he might want to add a couple of more storage containers to the condo... there were not many that had lids when we were there. A couple of additional cooking spoons to be used with teflon pots would also be great. We much appreciated having a full sized ironing board as well. My husband calls me crazy that I iron my clothes when on vacation, but I do... on that topic, the iron was a bit flaky and might be on its way out... just a heads up, but we did ok with it while there. Otherwise, not a problem. The wireless was great to use to do homework on the next days activities and the bed was ultra comfortable. Thanks again Jim for having such a great spot! The best choice of the trip! Great room, great owner (very organized and easy to work with.. no problems at all. ), and a great beach!!! We drove all over the island... if you want a slightly secluded sleepy relaxing bay area to kick back and not worry about life... this is it! And I'm very picky. Seriously, no complaints. It was wonderful, and we will return. Awesome Condo. I will definately return. I will be telling friends and family. Loved the studio apartment. The bed was comfortable and we could sit on the lanui and watch the ocean. Just a few steps to the beach. Great beach for snorkeling and swimming or just relaxing reading a book. I used to sit under this grand nut tree. What a cozy, clean, modern unit with all the comforts of home. A high end king size mattress(same as we have at home) was a pleasant surprise and dreamy. The kitchen lacked virtually nothing you wouldn't have at home, we had privacy and a comfortable environment to relax in. Ceiling fans and well vented windows at both ends of the unit made it easy to find a good comfort level, day or night. Although the unit wasn't "ocean front", it might as well been. You still had ocean views from the lania or a 1 minute walk through the small, secure complex to get your feet in the sand. Perfect!After numerous stays in Maui, usually in a motel type room in some resort setting with crowds, this was a breath of fresh air and we'll be back again in the future for sure. Napili Bay was an amazing, beautiful, safe bay for snokeling, swimming, bogie boards or just relaxing to watch the sunsets in one of the beach chairs provided with the unit. They also provided boggie boards, big beach towels to use and even a small cooler to keep your things cold on the beach. Unexpected pleasures you just can't bring with you.Being originally from New Zealand, I consider myself a good judge of nice beaches and the Napili Beach/Kapalua Beach area is as nice as almost anything we have at home and the best I've seen on the island!! You owe it to yourself to spend those valuable vacation dollars and time in a unit and area like this. Resturants and a well stocked General store in easy walking distance. Having stayed at Napili Bay Resort previously we new what to expect. Condo 217 lived up to oue expectations of having a wonderful, comfortable stay on Napili Bay. first time in 217 and think it is a great value in our favorite location ever. We can't wait to return. Appreciated the quiet, well maintained condo and dealing with aloha condos was a breeeze. This was a delightful temporary home. The unit was wonderfully compact and complete. All basic needs had been anticipated. For the large part, it was quiet, yet within reach of stores and coffee and, of course, great beaches. On the one rainy day, we just burrowed down with books. It was great! We spent a week in unit 217 and were delighted to arrive to a gift basket and lovely presentation . Spotlessly clean, with the exception of the duvet cover. Nice furnishings, extremely comfortable bed, very cosy and private. The lanai has a good view of gardens and the ocean waves too. Loved the sound of the surf and birdsong. We will be back! Napili Bay is quite busy but the mornings and evenings are wonderful on the beach. This condo was perfect - a great value for the location. Nothing fancy or pretentious - just a nice relaxing place (which is the whole point of Maui, isn't it?) Better equipped and more comfortable than home. Easy walkng to 2 great beaches was a big plus. Tip: if snorkling is your thing, walk up to Kapalua beach (just north) - it's even better than Napali. Location, value, quiet and clean = great vacation. Great beach, cozy condo, quiet area, clean facilities and great weather allowed us to celebrate our anniversary with comfort and convenience. There isn't anything bad I can say about Unit 217 at The Napili Bay - the location is amazing, the beach is the best i've ever spent time on.. loved swinning with four giant sea turtles right outside the condo and most importantly, the condo is outstanding, very comfortable and just enough ammount of rustic-ness to it to make it charming. I will be back one day soon to 217! We had a really good experience with aloha Condos. When we arrived there was a basket with fruit and chokolate and there was nice and clean. We felt very welcome. The Condo is very near shopping facilities, and in a reasonable distance to Lahaina where there is plenty of nice and cosy restaurants. Napili beach is a really beautiful beach, and we fell a sleep to the sound of the waves. We definately recommend this aloha Condo. I found this place 10 years ago from Frommer's-listed as a great, inexpensive option for Napili. First time stayed beach front and center, upstairs. This time far back, on the side, partial beach view (upstairs). I prefer the front and center beach view, but if you want to be a little removed from the hub-bub, you may prefer 217.Jim is very organized, sending periodic emails about your upcoming stay. I like these and found them helpful and gave me peace of mind that everything was taken care of.The room was perfectly clean on arrival. This unit does not have some of the upgrades I saw in other units (granite counter tops, newer appliances), but it was fine. Guests here tend to be quiet-definitely not a party spot, which I love. There is some early morning noise from the surrounding birds and sprinkler system. Since the birds can't be controlled maybe the sprinklers could go off a little later (8 instead of 7?). The on-site manager is super-friendly. Hot water can be a little iffy, but generally was fine-just a few times it took a while to come on. The exterior of the building could use a paint job. Jim leaves you a binder of info about the area, which is helpful.Location is super. Napili Beach is great (although a little too crowded) and the sea turtles around the corner make it all a perfect spot. Very relaxed atmosphere. Everyone we met at Napili Bay was very friendly and gave us some great recommendations for restaurants, etc. Loved all the handy guides left in the condo. Living space was a little smaller than I expected, but was not a problem. The beach in front of the condo was really nice! Reviewed by The Bennison Family! The Good- Reasonably priced, Safe, Nice furniture, Clean, Nice beach out back, local phone, cable, dvr, towels, boogie board, fully stocked kitchen and dish washer, welcome basket, Laundry on site.The Bad- Room is cleaned at the beginning of your stay only, No a/C, Size is appx 400 SF, The Ugly- Condo owner lives in Kauai and accused of being too messy, which is not true. We had to call and email several times to get the matter worked out and get our full security deposit credited back. We did get our full deposit back a little over two weeks from the last day of our stay. I've been managing my 5 vacation rentals in Hawaii since 1998 and have been very fortunate to had less than a handful of guests like these. As part of my process of charging guests for reservations, I run a security deposit authorization before their arrival and only convert that authorization to a charge if there are problems. The standard check-in time is 3PM and these guests checked in at 11:30AM - 4.5 hours early - thereby causing problems for our cleaners. Guests can choose to pay for an early check-in of 9AM at booking and avoid causing problems. The standard check-out time is 11AM and these guests checked out at 12PM - 1 hour late. This caused our cleaners to get a late start and truly scramble to get ready for the next guest party that checked in at 3PM. Guests can choose to pay for a late check-out of 6PM at the time of booking and avoid causing problems. These guests left the condo in a disaster state when they left. All of the dishes had been used and none were washed. There was sand everywhere and no trash had been taken out. We don't require our guests to do their dishes but hope that they provide some consideration for the cleaners - start a load in the dishwasher, take their shoes off before entering the condo, take out their trash frequently. Leaving trash in the condo will only bring in pests and there is a dumpster very close to the condo to dispose of trash quickly and easily. After I spoke with these guests about the problems that were found in the condo they denied them all. They did accept the facts that they checked in early and checked out late but didn't seem to understand the negative impact on others of their actions. After 4 long (and sometimes terse) phone conversations with them, I felt it was best to refund them the $50 that I has charged and show them consideration above and beyond what many - especially my cleaners! - felt was justified. It was their honeymoon after all and I guess if you're going to have a time in life when you should get extra consideration, this would be one of them. Hopefully they will have a long, compassionate and considerate relationship with each other through the years. Our condo. at Napili Bay Resort was clean, the towels were new and clean, we had a beautiful basket full of snacks and fresh fruit as a welcome gift which was a very nice touch. The only thing that I think people should know before they stay at Napili Bay is that there is very little privacy. Since there is no air conditioning windows are open in everyones unit, you can hear your neighbors sneezing, eating, using the shower etc. You can also hear any conversation. If you like to be quiet and want to sit on your porch and not say anything to your travel mate that you do not want to share will your neighbors then you are fine. There is a common area with grills and washers and dryers which is well maintained but the amenities have very obviously been around and not updated sine the early 80's. Overall very shabby chic. Aloha and Thank you for your review. The Napili Bay Resort is a wood structure and all of the condos are studios with the same size. There are two buildings that together form an L shape. The beachfront building (condos 101-109 & 201-209) sits directly on the beach (lower portion of the L) and the beach view building (condos 110-118 & 210-218) sit perpendicular to the beach and ocean. I own condos 201 and 217. When staying in the beachfront condos the sound of the ocean drowns out most of the sounds between the condos and the people on the beach - it depends up on how strong the waves are. With the beach view condos, the ocean sounds are not as prominent as other sounds - like your neighbors, the song birds and the wind through the trees. Fortunately for guests who stay in condo 217, each of the condos adjacent to it - 216 and 218 - have occupancy restrictions so that no more than 2 persons can be in those condos just like with 217. In my experience staying in condo 217 - probably a total of 1 year of time in the 10 years I've owned it - I've once or twice asked my neighbors to keep to keep their voices down. Every time they have been respectful of keeping it peaceful for everyone in the resort and I didn't need to ask them again. This is very typical of the type of persons that stay here - they come for the low density and to get away from the hustle and bustle of the other areas in Maui. Over the years, I've found our guests at The Napili Bay Resort to be very considerate and respectful of others and maybe that is another one of the reasons that guests keep coming back year after year. I had read many great reviews of this condo, but it lived up to them all! The condo is breezy, clean and wonderfully set up. I really appreciate the good quality bed, nice sofa, TV even pretty nice cookware! Napili Bay is truly a small piece of heaven and I will be back! Condo 217 was is a great condo to stay in. Newly updated, this condo was quite comfortable and very reasonable priced. The garden view (with partial ocean) was worth the savings, rather than being in a direct ocean view condo. This unit had no AC but wasn't needed. The TV was nice to have at night because Napili Bay is in a quiet location. Thing to note when concidering Napili Bay:1. Vehical rental is a must.2. Driving time is substantial to other parts of the island. 3. The beach is beautifull but may not be suitable for small childern, due to the surf conditions.4. Napili Bay is not in the dry area of the island(it could rain briefly). 5. Leave your kids at home for this unit! 2per-max.6. An absolute stunning beach.7. Beach is semi quiet.8. Good for boogie boarding.9. Resturants on either sides of the beach(the Gazebo is tops for breakfast, but be early or wait). Access from "The Shores" or beach.10. Groceries are a 10min walk away. My wife & I enjoyed the semi-isolation of Napili Bay. This bay is beautiful!The place was quaint, had a view of the ocean from the lania, a very comfortable bed and was well equipped with modern appliances, an HD TV & PVR. I must point out though, someone prior to our visit fumigated the place using a common over the counter spray like Raid. It was a rude awakening to discover as soon as we entered the condo. It absolutely reeked!To tell you the truth, my wife must have been really tired as I was surprised she didn't refuse to stay the night. We both had sore throats and numbed tongues the next morning. The smell lingered for the next few days. For this reason, I am reluctant to ever book this condo again as I found this an unacceptable practice. Contrary to what you might think, being 50 yards from the beach is preferred to being right on the beach. Great privacy from your lanai without losing the whole beach affect. You can eat your meals in your boxers if you so desire! What a great place to welcome the new year! We stayed in unit 217 over the new year and it was a fabulous experience. Initially, I was a little worried that the resort and beach would be noisy and crowded, as we were traveling at a very busy time of year, but it wasn't. The beach was busy, but never crowded and the resort itself was quiet and relaxing. Our unit was so clean and had everything that we needed. We really appreciated the beach chairs, the boogie boards, the beach towels and the little cooler. The bed was very comfortable and had a good selection of pillows to choose from. It was never too hot in the unit, even though there is no A/C. It would have been nice to have a little battery operated light for the outside table, as we ate outside each night. We loved that we could walk to so many places. Just steps to the beach, the breakfast place, the restaurant for drinks at sunset. Even the grocery store, bank and post office were only a 15 minute walk away. This was our first Hawaiian holiday and we are totally hooked and want to come back next year. My boyfriend and I stayed at 217 Napili Bay and we really enjoyed the suite, It really felt like a home from home. The owners left a gift basket of local fruit and snacks which was such a lovely thought and well appreciated after a 5 hour flight. The suite is beautifully decorated in modern style, very clean and everything you could need was there from a flat screen tv and wifi to simple but useful things like plastic food containers and a cooler box for picnics, and even dishwasher powder. Also the washer/dryer area and the bbq nearby was very handy. The only thing we felt would have been useful was a small battery operated lamp or something similar as we tended to eat dinner on the lanai at night so a little more light would have been really handy. Being so close to the beach was perfect and we definitely miss the routine of grabbing drinks, snacks and beach chairs to go watch the sunset. We'd like to thank the owners for a lovely, perfect stay and would definitely stay here again. My wife and I stayed in unit 217 for 4 nights in late September/ early October, 2009. The condo appeared just as I had seen it on the Aloha Condos website, and matched the reviews I had read on Trip Advisor. Although initially pleased with the condo, it seemed to grow even more cozy the longer we stayed. The condo owner has supplied virtually everything you'll need on your stay within the unit, including beach towels and boogie boards. The unit is recently re-furnished, with a very comfortable visco-elastic mattress and nice couches, tables, and night stands. It even has an HD flatscreen tv for watching television or movies. Nearby the condo (about .5 mi up the road) you'll find a convenient store plaza off the main road. It has a grocery store, two coffee shops, and places to catch a meal like Maui Tacos. If you're in the mood for grillin', the condo shares two large Kenmore BBQ grills that are more than adequate. One word about noise: from this unit location, the wave noise is almost nil (I was worried the units directly on the beach would get too much wave noise) and there is very little people noise (especially in comparison to the beach front units). On the other hand, there is quite a bit of bird noise in the morning (or, at least while we were there). I guess it depends on how you like to wake up! The condo had a very comfortable bed, DVR, prompt maid service, excelent kitchen appliences -- pretty-much everything you could want from a vacation home. It was well-kept and the manager was very polite. We could not be happier with where we spent our honey moon. Loved this condo. Great location with beautiful Napili Bay beach steps away and great snorkeling nearby at Kapalua Bay and Hololua Bay. We loved the natural "AC". This condo had everything we needed for our stay. Great communication from Jim throughout the process. We'll definitely stay again! The condo was amazing and perfect for what we needed. Napili Bay is the best beach we saw while we were in Maui. You couldn't ask for a better location. The kitchen was very well stocked except I would bring some ziplock containers if you plan on making a lot of your own food. There were a few containers but not enough for us. We ate breakfast and lunch at the condo most days and went out for nicer dinners in the evening. We did have one small problem with bugs (termites) one day, but it was handled swiftly by the staff and we were able to continue our vacation relatively hassle free. Overall, this condo was the best condo and location for the price we found anywhere. We still think so! The bed was even nicer than our own and we thought ours could never be beat. One small note about food, don't bother eating at the Gazebo. It's rated high on tripadvisor but the food is average and birds will land on your plate without hesitation (gross!). Definitely eat at Roy's (incredible food and about 2 miles south of the condo). If we had known the condo was so comfortable and there's so many more things to do in West Maui, we would have stayed couple more days. The price for the condo was very reasonable. It was clean and equipped with everything we need. I was surprised it even had 2 beach chairs, 2 boogie boards and 2 beach towels ready for us to enjoy the beach which is just behind the condo. The simplest thing sometimes is the most important. The bed sheets, comforter, and the bath towels were soft, the pillows were firm. We slept so well every night. Even though there were many restrictions in the condo such as you can't hang anything on the patio railing to dry your wet swimwear or towel, there is a cloth liner in the bathroom for you to do that. At first I wonder if we would stay cool in the condo with just 2 ceiling fans but to our surprise, it kept us comfortable through the night. With the free Wi-Fi internet, we were able to access the internet to search for near by restaurants and to get directions. Lastly, I regret not writing in the guests book. Most importantly, I forgot to read the guests book because many previous guests had left very important travel information such as the best beach to hang out, restaurants, and shopping. Lovely condo, wonderful to stay within steps of a beautiful beach. A very good value with a nicely furnished condo, everything we needed. Would definitely stay there again. This was the second time my husband and I stayed here; the first being last July for our honeymoon. #217 is perfect because it's very private, but still steps away from the beach. It's close enough to everything (Front Street is only a few miles away). Jim is an excellent host and left us a really nice basket with fruit and candy - the managers onsite are also great, they checked in with us a few times when we arrived to make sure we had everything we needed. The unit is clean, has new furniture and is very cozy. We cooked a lot of the time on the barbeques downstairs this time; the last time we ate out a lot but we felt the food was so much better when we made it. There's a great ethnic market a few miles away where we got a lot of great seafood really cheap and grilled it. The beach was semi-crowded, but never overly so. (it's a private beach). I would highly recommend this unit for 1-2 people; it's a studio condo and not huge but roomy enough with a fully stocked (utensils and stove, dishwasher, etc) kitchen, private lanai outside, and swimming gear like boards and floaties. If you prefer being around tons of people and like more touristy hotel settings, then this wouldn't appeal to you. But if you like your privacy and don't want to feel like you're up to your ears in people, this is an excellent choice. My brother booked this property for all of his wedding party and our family. We had an absolutely wonderful experience and would love the opportunity to return. Lee was very hospitable toward us and does an amazing job of keeping the property looking beautiful & immaculate. The location is wonderful and Napili Bay beach is beautiful. It was great having that beach feel like "our" beach. There is enough to do there if you don't want to go exploring around the island, and it's wonderful to be right on the beach so it's easy to take snorkel gear, etc. with you from your room. It was wonderful that we had a welcome package waiting for us in our condo, and there was snorkel gear, beach chairs, & other equipement there for us to use. The condo was very nice, even better than in the pictures. We felt very safe in this location, and at such an unbelievable price! If we ever do have the opportunity to return to Maui, we will make every effort to book with Aloha condos. Beautiful condo! Well equipped....close to beautiful beach.....quiet location. BBQ on site was nice. Clean and organized living space. Perfect for 2. Thanks for the great vacation spot! We had the most wonderful time in Maui, and this condo was the perfect place to come back to from our explorations. It was clean, cozy, open, and the kitchen and bath were really nice. Swimming with the sea turtles out in the bay right in front of the condo was a nice plus. I was also able to keep up with my work with the wireless internet connection (as well as making our friends jealous with pictures), while sipping fresh kona coffee from the lanai. Every evening at Napili Bay the residents take cocktails and beach chairs out onto the beach to watch the sunset. Truly magical.Thanks Jim! This was our forth stay and we really enjoy the plae. It is quiet, clean and has a great beach. the unit is well equiped and comfortable. It's a great place to chill. We absolutely loved our stay in 217. The bed was extremely comfortable, the kitchen was stocked with everything you could possibly need and most of all everything was impeccably clean. You can't beat this location either - footsteps away from the best beach in Maui. When we return we will defintely stay here again. Mahalo. We have stayed at Unit 201 Napili Bay on a number of occasions. The location, right on the beach, is superb. We enjoy the sound of the sea, and the proximity to the bay. The unit, although smallish, is neat and tidy, and owner Jim Dornfield is most obliging. Highly recommended. Found the Napili Bay through tripadvisor.com and had read many consistent reports, so my wife and I thought we'd give it a try. We were not at all disappointed. First of all, the location is fabulous. We never needed to leave Napili, and the bay is wonderful. If you get tired of snorkeling and swimming in Napili Bay, you can always make the 10 minute walk over to equally stunning Kapalua Bay. The property itself is small, quiet, and you literally walk out onto the sand. There are a few peculiarities, which we quickly got used to. It might take a night or two to get used to the noise of the pounding surf. The condos are always open....no glass, only screens and shades. No A/C but we never needed it and enjoyed the openness. The condos are only about the size of an average hotel room, but that's all you need. Kitchens are fully functional, well-stocked, and clean and new. Stop at Costco (by the airport) or Safeway (Lahaina) and get your groceries and you won't need to leave. There's a small grocery store with a few other stores (including Boss Frog snorkel rental) just up the road. In a sense I hate to write such a positive review, cause I really don't want the Napili Bay to become hard to get into. It's not a big resort, not for kids, and not super elegant. It's just an excellent quiet place for a couple to get away and be lazy! We love it and are returning soon. We loved staying in Napili! This condo, for us was in the perfect location, we liked this beach much better than the touristy ones near Kaanapali. The huge sea turtles in the reefs near this beach were awesome. The condo itself was also perfect for us, not extra luxuries, just set up with everything you would need, even boogie boards..The grounds managers were also very helpful and nice. When we go back to Maui, we will definitely try to book a condo in Napili Bay again. Thanks! I have stayed there many times and have never had a bad time.It is so much more relaxing than a big hotel and nicely kept up.I am planing to go again this oktober . We love Napili Bay and certainly enjoyed the special discounted rate! The studio is perfect for a quiet low key get away. We will return as often as possible!! LOVE IT! We loved the proximity of this place to the beach and the unit itself was comfortable. We forgot the code to get in the door so we had to stay at the hotel next door for one night. The owner of the condo called us back the following morning with the code, but we had already been charged for that night of course (even though we didn't use the condo). We wished there had been someone on the island who could have helped us at the time- our perhaps a number that we could have called after hours to get the code. I am sorry that you didn't have the information you needed to get into the condo upon your arrival. I've not had this problem with guests since your stay in 2005 and always try to do my best to make sure it doesn't happen. Detailed check-in information is provided to all of my guests, along with local contact information in case of problems, at least one month prior to their arrival. I've also started contacting my guests within a week of their arrival day to double-check with them and make sure that they have everything that they need to get into the condo. Beautiful place, great location, would love to go again! This place is great, and I would love to stay here again. It's clean, conveniently located, well furnished, and three steps from the door and you're on sand. There's nice snorkeling at the far end of the beach and good restaurants just a short drive. The low prices make it even more attractive. Our daughter and son-in-law stayed in Unit 217, enjoying the ocean view, private lanai, and a very comfy king-sized bed. The room came complete with beach boogie boards and flippers. It was close to the laundry (very clean) and bbq area, where we shared family meals each night. They cried when they had to leave, and would definitely recommend this to any other young couple. With Napili Bay Resort Condos right on the ocean, they had immediate access to ocean sun and fun! Condo was in an ideal location. Perfect access to the beach with a great view! Condo was very nice. We can't wait to go back! This was almost perfect. Very reasonable, 10 minutes from Kaanapali, and Lahaina. It is right on the beach. Wonderful view of the neighboring islands, Lanai and Molokai. Paradise. The only thing that stopped it from being perfect was the tiny little ants on the countertops. Couldn't do much food preparing, but everything else was awesome. Great place to stay on Maui. A few steps to Napali Bay, one ot the best beaches on Maui. Well furnished condo at reasonable prices. Our stay at Napili Bay Resort was lovely. The room was well appointed with comfortable tropically decorated furnishings. Although this is a side unit, we nonetheless had a spectacular partial view of the beach and beyond. We were impressed upon checking-in to find a welcoming basket full of tropical fruits and confections. The laundry room and outdoor picnic/grilling area were conveniently located as was car parking. We were suprised to find such a nice facility that offered so many conveniences plus easy beach access at a reasonable price. We will definitely stay at this resort again! We really enjoyed our stay in Napili Bay. The condo was really well kept and there was everything that you ever need/want. The only drawback was the wind. WOW! That part of the island is fantastic but alittle isolated....which was good for us! I would recommend the condo for anyone on a budget, anyone wanting to "get away" from the bustle and a as a great place to relax! Thanks. This was our third rental of Unit 217 at Napili Bay. The location is fantastic. Eating breakfast on the lanai while watching humpbacks breach is something special. The beach is great, as is the proximity to Kapalua and Lahaina (close enough to restaurants, golf, etc without being swamped with traffic). The condo is perfect for a couple, and we especially liked the sound of the ocean at night. The only downside was having an inconsiderate neighbor for a couple of nights who played their TV (loudly)all night--I guess to drown out the the sound of the ocean. Otherwise, we'd have rated this perfect. We will rent Unit 217 again on our next trip to Maui. This was probably one of the most relaxing vacations I have ever had. It was a quiet location and while others were fighting for parking to be able to enjoy Napili Bay we just had to walk across the property and we were in turtle heaven. The room was clean and very comfortable. The kitchen was well supplied and I can hardly wait to return. If you have a car and don't mind driving around a bit this place is for you. You are close to some great beaches, but you will have to drive to get to them. Napili itself is right there, but it is fun to explore other beaches too. Not many resturants within walking distance. I am planning to return to Napili Bay. We absolutely loved it. Maui was beautiful and this unit made our stay in paradise perfect. We were welcomedon our first day with a lovely fruit basket. The kitchen was equipped with everything we needed and the bed was comfortable. The complex was quiet. We sat out on the lanai each morning and watched the dolphins play. We were steps to the beach which was just gorgeous. Beach chairs and a cooler were even provided. Snorkeling was great-lots of turtles call Napili Bay home. There is no air conditioning in the unit which was not a problem for us due to the great breezes but it's something to be aware of. I would prefer to stay here than in the noisy, crowded beachfront resorts. If your looking for a peaceful getaway, this is it. I have nothing bad to say about our experience in Unit # 217. Would stay there again in a heartbeat. We stayed in Unit 217 for 10 days last October. This was our second stay at the unit in two years and once again it lived up to our expectations. It is a pleasure dealing with Jim/Aloha Condos and the rental process, from initial booking right through to completion of our stay and return of deposit, was handled efficiently as always. The unit is as described on the website and was extremely clean and very well presented (and this is from somebody who is VERY picky (NB: see observation below*)). We were greeted with a welcome gift basket on arrival - a nice touch. The unit was well stocked with linens/towels/pots and pans etc and you couldn't want for anything when preparing meals. It had its own boogie boards and beach chairs/coolers/towels. Although the unit does not have air-conditioning (it has ceiling fans, however), I can honestly say that we never felt uncomfortable with the heat at any stage during our stay; the winds kept the unit cool and ventilated throughout the day/night (we have stayed in a similar resort in Kauai and this was problem). The amenities on-site were great - we made use of the 2 communal barbeques and washers/dryers. The resort grounds were well maintained, and the staff were very friendly and courteous. We have stayed in 3 different units at Napili Bay and on two occasions in 217. Personally, we prefer Unit 217 for location, as it is just off the front of the beach (to the side, but still with a great ocean view) and provides a little more privacy during the late afternoon/early evening whilst relaxing on the balcony. *One observation from last year's stay was that in our opinion the living area seating appeared a little worn due to wear. I note, however, that whilst looking at Unit 217 recently, Jim has renovated all the living/sleeping area furniture and furnishings and the unit looks fabulous. Congratulations once again to Jim for making our stay a most memorable one. Thank you for your feedback and I also thought that the furniture was getting a bit dated. It hadn't been changed since I did a complete remodel back in 2000. So last month decided it was time to upgrade and I did a complete remodel of the living area. I replaced all of the furniture with lovely and luxurious solid mahogany furnishings and mellowed out the color scheme with more earthy browns and sage greens. I replaced the headboard, night stands, sofa, coffee table, dresser, and wall mirror and as well as adding a new desk, chair and entertainment stand. I also repainted and wall-mounted the 26" HDTV which now has over 300 digital channels and dozens of High Definition channels. You can even record your favorite programs on the DVR so that you watch what you want on your schedule. I really hope that you come back and enjoy all of the updates. The condo was wonderful! Upon entering the condo there was a great gift basket waiting for us. It was a great place to call home for the week. Unfortunately during our visit in Hawaii it rained the entire week and we spent the majority of our trip indoors, so we were very pleased to have some a wonderful, cozy place. You always take a chance reserving a vacation rental on-line, will it turn out to be as nice as advertized? In this case it was better than we hoped. From the fruit basket greeting, to sitting on the lanai watching the whales, to sitting on one of the prettiest beaches we've seen in the islands, this was a truly wonderful vacation condo. While the north end of the island is perfect for a quiet vacation, you had a grocery store and snorkle shop just a couple of minute walk from your door, and a nice beach stroll to oceanside dining or cocktails at sunset (which was not blocked by the offshore island). Not only would we stay here again, if we could afford it we'd buy a unit. 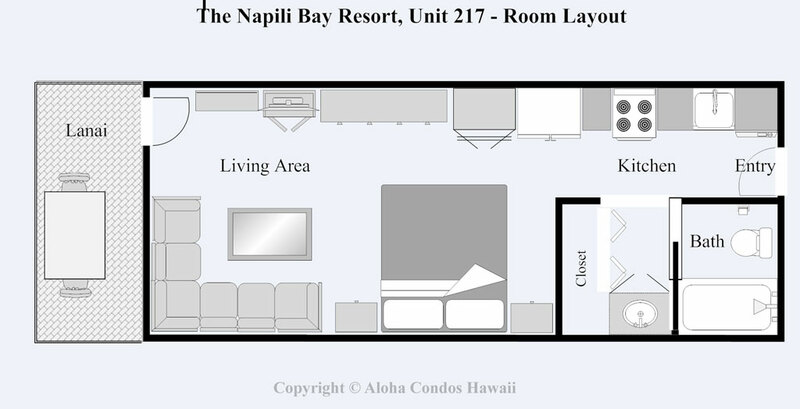 Napili Bay Resort (NBR) is my family's favorite vacation spot and Unit 217 is our favorite vacation home rental. We have rented vacation homes in Europe, Canada, Mexico and across the US. We always return to Napili Bay as our vacation place of choice. Napili Bay offers my family a safe, comfortable and relaxing environment to spend our vacations. The key attraction to Napili Bay Resort is convenience. If we choose to sightsee, NBR is close to so many attractions, restaurants and shopping. If we choose wind-down, NBR gives us the chance to sit on the beach, swim and only worry what to have for our next meal. For families with youngsters, NBR is in an ideal location in a quiet residential neighborhood away from the hustle and bustle of mega-resorts. We have been coming to NBR for ten years and will continue to make it our prefered vacation spot for many more. My husband and I planned a last minute vacation to Maui and found a piece of heaven at Napili Bay. The complex is more "old hawaiian" style and the studio is nice for a couple. The view from the balcony was terrific and we saw many whales. The condo had everything we needed for our stay, ie full kitchen, beach chairs, beach towels, cooler, wave boards, etc. Check in was easy since you get the key code prior to arrival. Rocco made the reservation process so easy and was very helpful. We have been to Maui several times, but have never stayed in Napili. It was great to get away from the crowds and enjoy the beach which is just steps away from the condo. The condo was clean and well kept. There was no air conditioning but had a nice breeze at all times. Once negative was the walls were a bit thin. A short drive or walk to the Ritz resort area is great for a nice dinner out. We will definately be back. We love The Napili Bay Resort! I saw somewhere that the loose motto of this place is, "Beach chairs and boogie boards." This sums up the experience save one key piece. The community (I almost say family) of The Napili Bay Resort is really nice. When you stay there you meet almost everyone. You meet them on the beach every afternoon for cocktails and sunset viewing (drag your beach chair out there) and later in the evening there is an informal bbq session where everyone sits around the courtyard to "talk story." Beautiful beach out in front and some nice little tide pools for checking out. The room was great and close to the bay, but not too close. The surf was a little noisy when we stayed at beach unit 5 years ago. The surf noise reminded me of the industrial plant I worked at. That is why 217 was just perfect. The tree on the beach is fantastic!!! We stayed at Napili Bay Condo 217 for our honeymoon and could not have been happier with our experience. The place was clean and had a relaxing tropical feeling. We found that it was nice to be in the building that was not directly on the beach, as it felt a bit more private. The bed was very comfortable, and the kitchen and refrigerator were very convenient to have. The beach at Napili Bay is beautiful, and we enjoyed snorkeling in the bay, especially in the early mornings. We hope to return to the Napili Bay soon and definitely recommend it as an excellent value and a wonderful relaxing experience.